With over 500,000 YouTube subscribers, Steve & Chieri DeGregorio have taken the video world by storm with their popular children’s channel THE KIDS’ PICTURE SHOW. Now they are coming to An Unlikely Story to introduce two unique board books, ANIMALS and VEHICLES. Steve and Chieri will discuss their new books in an engaging and interactive discussion followed by a fun activity. ANIMALS and VEHICLES, inspired by the hugely popular YouTube channel, THE KIDS’ PICTURE SHOW, introduce young readers to their first words in a cool 8-bit style. 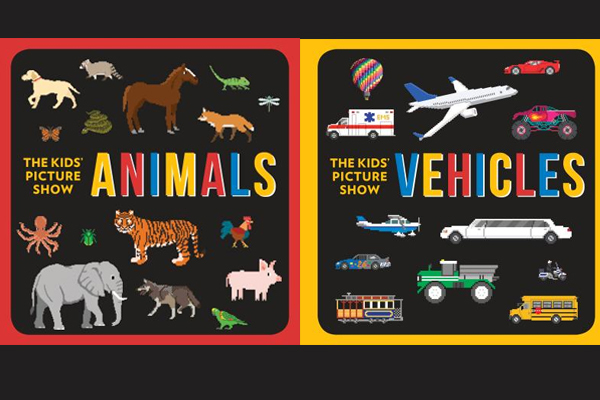 The sturdy board books are packed with images of animals or vehicles and are the perfect introduction to creatures from around the world and things that zoom, fly, and rumble for babies and toddlers. The 8-bit illustration style makes the book even more fun and accessible for young children, and will also appeal to parents, grandparents, and anyone who has played classic video arcade games. Steve and Chieri DeGregorio are the parents of two boys, one of whom has autism. They created The Kids’ Picture Show YouTube channel for children of all learning styles.